How well do steam mops kill germs? Answer: Good! The BISSELL PowerFresh Steam Mop did a very good job killing germs in my experiments. The steam is really 212°F and is hot enough to kill germs. It takes time and multiple passes over an area to get rid of the majority of the germs, though. One quick pass isn't going to completely sterilize the floor, but I think it is totally worth using. It is great to clean with just water instead of "chemicals". Keep reading for all of the experimental details. If you want to know about the scientist doing these experiments, please read my About the Scientist page. 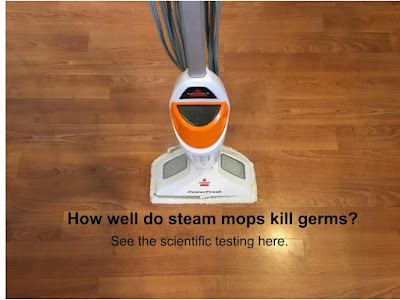 How well does mopping the floor with the steam mop kill or remove germs? After many requests, I finally tested a steam mop! I purchased this BISSELL PowerFresh Steam Mop . First, I vacuumed the crumbs, dirt, and massive quantity of dog hair off the kitchen floor. Then, I got the mop ready. The BISSELL PowerFresh Steam Mop is very easy to use. I filled the water bottle with filtered water. I screwed on the cap. I put the water bottle into the mop compartment. Then I put the mop cover on. I plugged it in and turned it on. There are 3 steam settings, and I used the most powerful one with the 2 plus signs. After a minute, the mop heated up. I could see the steam. I checked the temperature with my meat thermometer, and it really was 212°F (100° Celsius). Now, you are probably thinking that OF COURSE steam is at least 212°F. However, I've had carpet "steamers" that were really only spitting out mist that wasn't hot enough to be steam. So, I had to double check. Then I used masking tape to make 10 inch squares and labeled them. I swabbed each square with a sterile swab that was wet with tap water. I did not just touch one spot with the swab. I scribbled it all around the square. You can see the water marks it left. Then I rubbed the swabs onto clean, labeled, agar plates. I scribbled all over the plates with the swabs. These would be the dirty "before" plates. If you want to do your own experiments, here is a link to the same agar plates that I buy. Now for the fun part. I made sure the steam mop on the highest setting. I went over each square slowly. On some squares, I did 2 slow passes with the steam mop, up and down. On other squares, I did 4 passes (up, down, side to side). On other squares, I did 6 passes (up, down, side to side, up, down). After I mopped a square, I quickly swabbed that square and rubbed the swab onto a clean agar plate. The swabs always looked clean because the mop did a really good job removing dirt. The plates were incubated for 48 hours in my warm (about 90°F) incubator. I always do a negative control where I just swab the tap water and rub it onto an agar plate. It doesn't and shouldn't grow any bacteria. In case you are new to looking at agar plates, let me explain. The whitish/yellowish dots that you see are colonies (or piles) of millions of bacteria. Not all types of bacteria can grow on agar plates. Viruses do not grow on agar plates. Mold can grow on agar plates. So, just because a plate looks clean with nothing on it, doesn't necessarily mean that no microorganisms whatsoever were present. Dirty floor square after 2 passes with the steam mop (up, down). Dirty floor square after 4 passes with steam mop (up, down, side to side). Dirty floor square after 6 passes with steam mop (up, down, side to side, up, down). As you can see, there is some variation about how well the steam mop worked. There was variation on how germy and dirty the floor was as well. Overall, the steam mop does a very good job getting rid of germs whether it is wiping them off or killing them with the heat. My floors look great after using the steam mop, and I really love using it! Better yet, my HUSBAND loves using it! I usually make him do the mopping because he was the one who brought this sweet, handsome, filthy guy who we all love dearly into our home. How well does the steam mop kill germs WITHOUT mopping? In the previous experiments, the decrease in germs could just be from the mop wiping away the germs. For these next experiments, I'm testing how well the steam itself kills the germs. I tested with my thermometer and the steam really is 212°F. For these experiments, I taped rectangles on the floor that were 5 inches by 12 inches to properly fit the mop head (which is about 12 inches wide). I took "before" swabs of each of these rectangles. While the steam mop was steaming, I placed the mop directly on the rectangle. I timed it for 5 seconds, 10 seconds, 30 seconds, and 60 seconds. Then I lifted the mop off the rectangle. So, there was no "wiping" action at all. I set the mop directly down and pulled it directly up. Yes, the mop pad could have still picked up a small amount of dirt and germs, but the steam would be the main mode of germ-killing in these experiments. Then I swabbed the rectangle after its time with the steam mop. When I swabbed the rectangle after the mop was placed on it, the floor was still very dirty. This shows that the mop really didn't wipe away much of the dirt and germs. I was careful only to swab areas that the mop had full contact. I rubbed the swabs on agar plates. Dirty Floor after 5 seconds with steam mop. Dirty floor after 10 seconds with steam mop. Dirty floor after 30 seconds with steam mop. Dirty floor after 60 seconds with steam mop. After only 5 or 10 seconds with the BISSELL PowerFresh Steam Mop, there is still a lot of bacteria alive on the floor. By 60 seconds, most of the bacteria is dead. It is amazing to me that any bacteria can survive more than a minute of steam but some can. I did some cleaning cloth boiling experiments on a another page of this website and found that a few bacteria survived in cleaning cloths after 5 minutes of boiling. Overall, I think the BISSELL PowerFresh Steam Mop is awesome! I love cleaning with just water. It cleans in part by wiping off the germs AND in part by killing them with steam. It is important to vacuum the floors well before mopping. After a normal mopping, the floors will still have some bacteria on them. However, if you REALLY wanted to sterilize your floors with this mop, you could do it. For example, if a sick person throws up on the floor, you should clean it up with paper towel. Then go slowly over the area with the steam mop, over and over, and you will likely kill most or all of the germs. Be careful mopping with bare feet! I burned my toes a few times from the steam! Young children should not use this mop because it really can burn you. In addition, my fake wood floor (laminate) has not been harmed at all by 60 seconds or more with the steam mop sitting in one spot. I wash the mop pad on a hot sanitize cycle without bleach and hang it up to dry. I don't have the time or money to test every steam mop, but I may test another one. So, send me your suggestions. However, if you see actual hot steam coming out of your steam mop, then it must be 212°F like my mop, and that is hot enough to kill germs (not instantly, but with time). If your mop pad seems to be doing a good job, and you see nearly constant steam, then your mop is probably performing similarly to my mop. If you would like to buy this BISSELL PowerFresh Steam Mop, you can order it here on amazon . If you do use my amazon link to order anything, I get a small percentage of the sale. I use that money to buy agar plates and do these experiments. It doesn't matter what you order. You could order birthday presents. If you go to amazon using one of my links and place an order, I would get a small percentage of the sale. I would really appreciate your support for my experiments. Thank you. I have done tons of other experiments and have many more to do! Please see the list below of all the pages of experiments that I have. If you would like to be alerted when I post new experimental results, suggest an experiment, or send me a message, please like my facebook page. If you would like to find out more about me, please read my "About the Scientist" page. You can also email me. phd.annie@gmail.com.